Remember Borderlands 2? It came out a couple years ago, everyone played it a lot and generally really liked it? Of course you do. Well, it's back. The 2012 first-person shooter, which was hefty on its own and grew even heftier thanks to a whole bunch of post-release downloadable expansions, has come to the PlayStation Vita handheld. It arrived bundled as a download code for anyone who bought the new Vita slim last week, and it'll be widely available on the PlayStation Store tomorrow, May 13. In addition to the main game, the Vita version includes the mechromancer and psycho character classes, as well as the Mr. Torgue's Campaign of Carnage and Captain Scarlett and her Pirate's Booty add-on campaigns. How impressive, you might be thinking, that such a large game, with a huge open world, six playable character classes, seamless multiplayer and hundreds of sidequests, could all be made to fit on a handheld gaming system. But all that scope and scale comes at a cost, and in the end the handheld version of Borderlands just doesn't feel worth your time. It's become clearer than ever over the past several months that a game needs to run smoothly in order to be enjoyable, and the majority of our readers have gone on record to say that they care more about frame rate than they do about screen resolution. 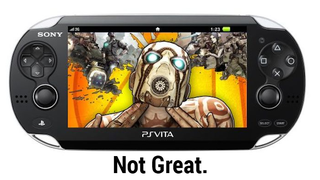 Unfortunately, Borderlands 2's frame rate on Vita isn't very good. ​Do You Care About Resolution And Frame Rate In Games? It makes sense that in order to get Borderlands 2 running on Vita, it'd need to lose some of the visual bells and whistles that make it so appealing on consoles and PC. And so it has come to pass - lots of visual effects, smoke, and bouncy physics effects have been stripped out, and the result is a game that looks and even moves flat. It's all just fairly ugly, and like I mentioned before, enemies all vanish immediately after you kill them, which ends each firefight with a vaguely unsatisfying, empty battlefield. A frantic attack into a raider camp is all the more tough to manage because the combination of stripped down visuals, jumpy frame-rate and weird controls leave everything feeling discombobulated and strange. Voice cues feel harder to keep track of, subtitles are difficult to read, and the low frame rate barely holds everything together. The Vita's processor doesn't appear to be up to the task of keeping Borderlands 2's many spinning gears going at the same time. There's a noticeable lag to everything, particularly menus. That's too bad, given how much time I tend to spend in Borderlands 2's menus comparing guns, swapping out inventory, dropping unnecessary items and assigning bonuses. The game's loading screens between areas are notably lengthy as well. I don't like playing first-person shooters on the Vita. The two most important FPS control-surfaces—the thumbsticks and the triggers—both don't give me what I need to feel precise and in control. The Vita's shoulder buttons are perched atop the screen, and the thumbsticks are too wiggly and don't offer enough resistance, so I feel like I'm flicking them around, rather than guiding them. So it was perhaps a given that Borderlands 2 on Vita wouldn't feel as good as it did on, say, PC. But as Killzone Mercenary demonstrated, it is possible to have better/decent first-person shooter controls on the Vita. While some of Borderlands 2's custom control schemes are better than others, none are as good as the default scheme in Mercenary, and the game's laggy performance and general unresponsiveness further complicate the issue. Borderlands 2 is at its best when four players are engaged in a pitched multiplayer fight against a massive boss. Unfortunately, the Vita version of the game only allows for two-player multiplayer, which is mathematically half as fun. Well… actually, I've had plenty of fun playing two-player Borderlands over the last couple years, but it's still a shame that one of the game's biggest selling points—super fun four-player co-op!—is cut in half. While I haven't played nearly enough of the Vita version to get to any of the tough post-game raid bosses, I have to wonder how it'd be to take on Hyperius the Invincible with only one other player. After spending a while playing the Vita version, I decided to fire up the PC version for the sake of comparison. I found myself hooked on the game again, spending quite a bit of the weekend digging into some of the (many) parts that I never played, including Tiny Tina's Assault on Dragon Keep, which, as our own Tina already said, is good stuff. It brought me to one of my biggest issues with Borderlands 2 on Vita: I don't want to start Borderlands 2 all over again, and I certainly don't want to start an inferior version of Borderlands 2 all over again. I have one level 30 commando that I've sunk a good 50 hours into on PC. I made a second mechromancer character and sank another 5 or so hours into her. Why on earth would I want to start yet another character on Vita when I've still got so much left to see on the PC? PS3 players can port their save between the Vita and their console—or at least, they will allegedly be able to once the game's May 13th patch hits—but that doesn't do much for those of us who played on PC and Xbox 360. Considering how superior the PC version of Borderlands 2 is, it's a real shame that players on other systems can't port their characters over. If we could, it would make the Vita version significantly more appealing. I really like the Vita, but the more I use it, the less interested I am in this sort of "It's a console game in your hand!" kind of thing. I already have Borderlands 2 installed on my PC, and if I want to start a whole new game, I'll do it there. My Vita's memory card is small enough as it is; I'd rather make room for other games. Borderlands 2 on Vita is the worst version of a good game. And I really mean that—the core game is still good, funny, fun. No matter how clunky the controls and watered down the visuals, it's still Borderlands 2 in a lot of respects. But without the smooth bounce of the console/PC version, and without those versions' four-player co-op, the Vita version sacrifices too much. Despite the fact that I was playing it for work, it left me routinely questioning why I was spending time on it when I could just play the game on PC. In this case, portability's not enough.